And still they come. 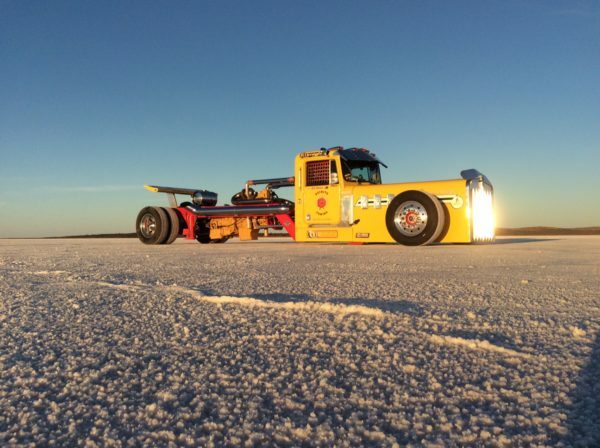 Confirmation today that Rob Waters will be joining the ‘Heroes & Legends’ celebrations with his awesome 1977 Kenworth W Series Prospector salt lake racing truck. Featuring the world’s first full custom channelled truck chassis, Rob’s ride is not only long at 9m but features more impressive numbers. Imagine how a set of lakes pipes 230mm diameter and 2.5m long sound at over 200kph! Running for the first time at Lake Gairdner in March this year, the Kenworth is sure to be one of the highlights of the 22nd Spectacular.